Supporters of migrant family reunification march away from Archer Park Monday, August 6, 2018, in McAllen. McALLEN — It began as a 30-person caravan from Upstate New York that traveled here. It will end Tuesday at the Port Isabel Detention Center. 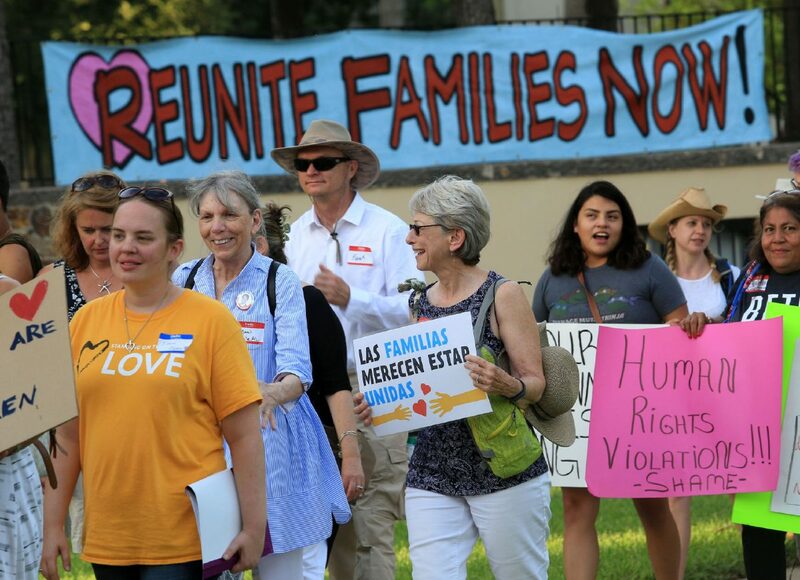 A group that began its trek July 31 as 30 concerned citizens swelled in support to more than 200 strong during the seven-stop tour, traversing the country as they made their way to the U.S.-Mexico border to speak out against the separation of families. 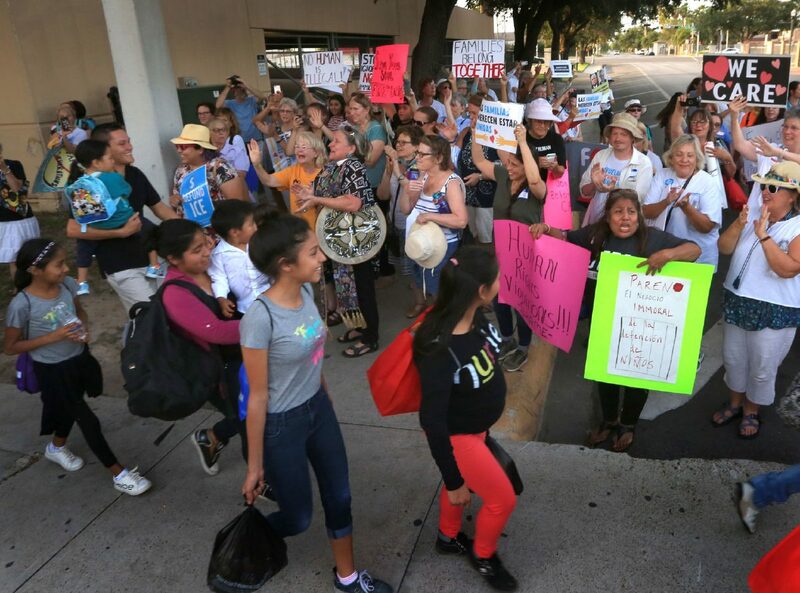 The group, the Grannies Respond caravan, will spend Tuesday visiting the Humanitarian Respite Center in McAllen, the Pharr-Reynosa International Bridge and the Port Isabel Detention Center, among others as they lend their support to those affected by family separations and refusals at ports of entry. 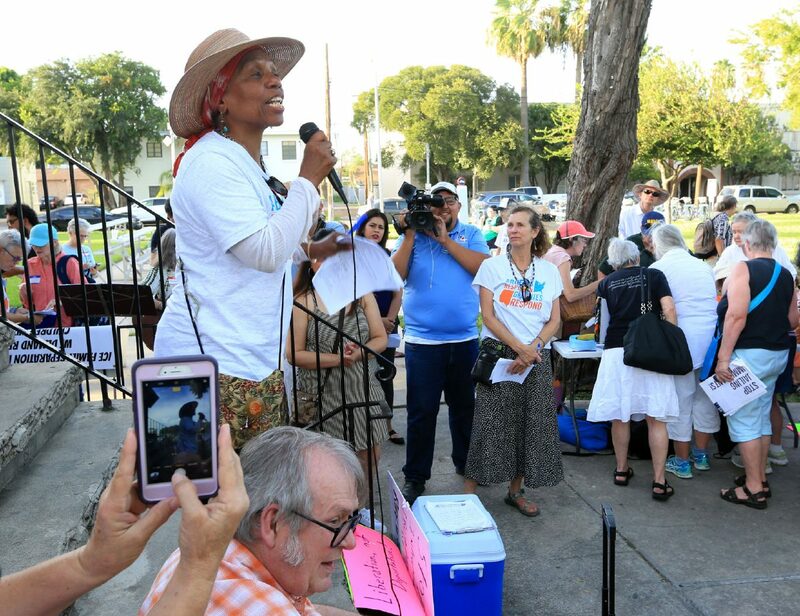 On Monday evening, the group convened along with their supporters for a vigil and protest walk from Archer Park to the bus depot, and then to the Catholic Charities-run respite center in downtown McAllen. A group of migrants pass by supporters of family reunification as they walk down the street towards the McAllen Bus Station Monday, August 6, 2018, in McAllen. The supporters, which included a group known as Grannies Respond, traveled from through the U.S. to voice their their disagreement with migrant families who have been separated. Rafiah Jones, a member of Grannies Respond, from Washington D.C., speaks out against migrant family separation during a protest Monday, August 6, 2018, at Archer Park in McAllen. The surrounding area of Archer Park was taken over by the sedans, vans and recreational vehicles of the roughly more than 150 people who joined the caravan in cities like New York, Pittsburgh, New Orleans and San Antonio, to name a few. The vehicles were painted in bright colors with slogans of support for the affected groups. “Reunite Families!! !” read the window of one RV parked outside Archer Park. The large group marched over to the bus depot across from Archer Park, then made their way to the respite center before reconvening at the park. Barry Nelson of Beacon, N.Y., the only “grandpa” in the group of all grandmothers, said he felt obligated to speak up for the values and morals of what he felt the country is supposed to represent. The 70-year-old joined his wife, Claire Nelson, 66, the only couple in the original 30-person caravan. Claire said that earlier Monday, the group was denied access into the Dilley Detention Center in Dilley, Texas. Yolanda Sanchez, who along with her sister Bonita Amaro, traveled nearly 2,000 miles from Sacramento to McAllen, said she met up with the caravan after hearing from other activists that the group was headed to the border. The 63-year-old California native said she felt compelled to act after hearing about the children being placed in cages. Sanchez said she and Amaro were most recently supporting a group of activists who protested near U.S. Immigration and Customs Enforcement buildings. She said her sister heard about the caravan and they decided to drive down to the border to lend their support. “Feeling, like what else can I do, and then my sister heard about the caravan,” Sanchez said. Jennifer Harbury, a local immigration attorney with Texas RioGrande Legal Aid, was also on-hand. Harbury said the caravan was another example of the reaction of the people to the administration’s actions.